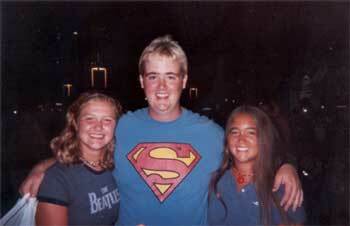 Alex "The Yeti" Caldwell, a Southwind soprano/trumpet player in 2004 and 2005, submitted this one. "This is a picture from finals night in Denver. In the picture from left to right is Erin Lilliefors, Alex "The Yeti" Caldwell (me), and Jennie Pesch. This was the last night for most of the members of Southwind would see each other 'til November." Thanks Yeti!